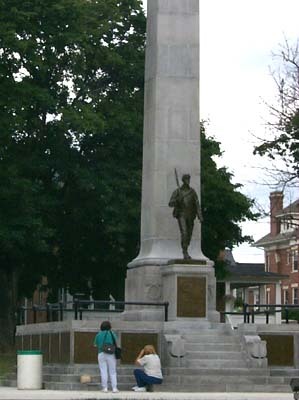 The Ebensburg War Memorial was erected in 1913 to honor the men from Cambria County who fought for their country. 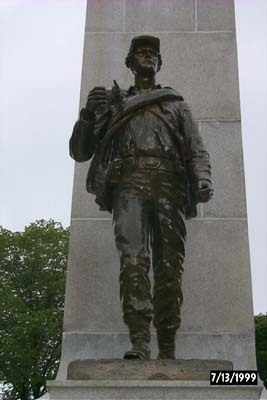 It contains the names of soldiers who fought in the Revolutionary War, the War of 1812, the Mexican War, the Civil War and the Spanish American War. It is located next to the old jail in Ebensburg. This list of soldiers is not to be considered complete and accurate. There were Cambria County soldiers that were not listed on this memorial. 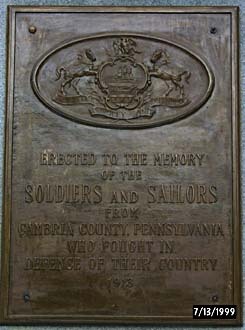 This may be due to one or more of many reasons, such as the entire family may have moved out of Cambria County before the memorial was built, or, the soldier may have joined a unit that was formed in another county. If you have not found your Cambria County soldier on this page, please check here, where we are placing the names of the soldiers that were not listed on the memorial. If you have information on a Cambria County soldier you would like to have remembered, please email the information about that soldier to one of us, and we'll place him on the "unlisted" soldiers page. You can either start with the first plaque and page through in order, beginning with the Revolutionary War, using the links at the bottom of the pages, use the search box below, or jump directly to a specific plaque.